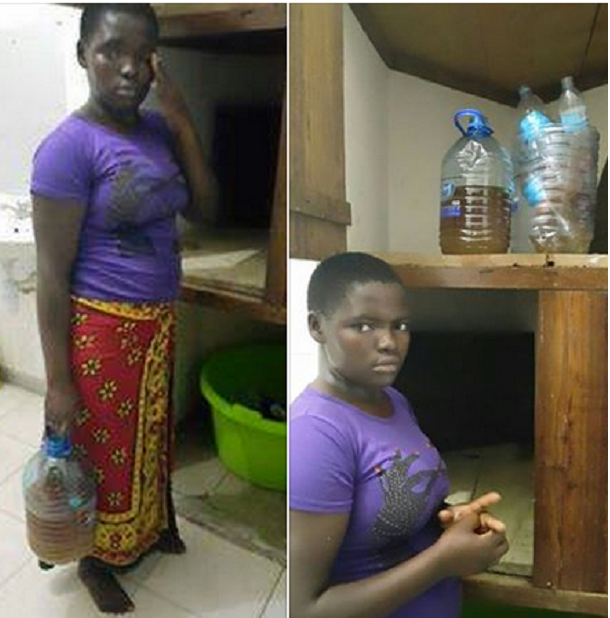 This not-so-kind house girl was arrested earlier this week in Mombasa Kenya for allegedly using her urine to cook for her madam’s family. While confessing to Modern Kenyan Police officials who arrested her, the 19-year-old girl said she did it because she was maltreated by the member of her employer’s family. She was caught after her boss installed a CCTV camera in the house following reports of child abuse. 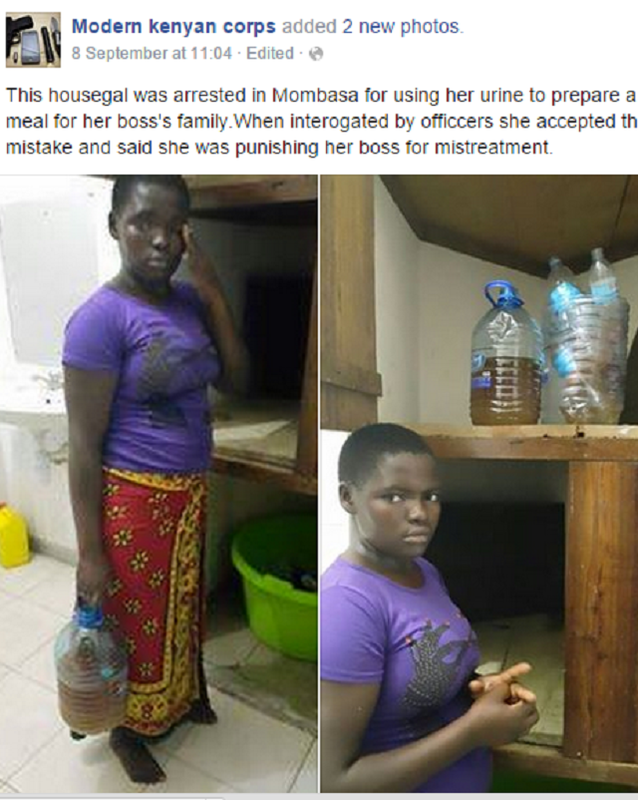 The employer was shocked to see her urinating in a pot of soup she was preparing. Why was she been maltreated by the family. Some people who employ house girls can be very wicked. Good for some of them to also be punished in this way. If say na fine girl, I for not ves. But na wowo girl. So I am ves. I will tie her down and pour d urine inside her mouth so that she can feel the taste of it. someone can never b gud to u ppl called house help once u know dat person is not ur mother,not minding she could be doing more than wat ur own mother does for u .am using my self as an example d girl I live with I give her coke,food,money to school but she tells her frds at school dat she’s bn maltreated.how? I ask maybe cos once in a while a flog her or scold her for doing wrong,yet I flog my kids more n scold them too…wat am saying regarding these ppl u can never please them once u r not their mother..at 19 they r maltreating u can’t u leave Dan cooking with ur urine for ppl to eat who is more wicked then? Haba is not fair na!even at dat she shuldn’t av gone so far by using her urine to cook 4 d family!! Idiots supporting her Drink piss nah if what she did is good for revenge. Give her a large glass of her rotten gutter, then the witch will never do that again. Even if she witchcraft dey go she will never do that particular evil again.